Low-cost carriers have revolutionized the European airline industry by reducing the cost of travelling and expanding rapidly in emerging markets but do all European citizens can benefit from low-cost airlines the same way? Which areas are the best-served by low-cost airlines in Europe? 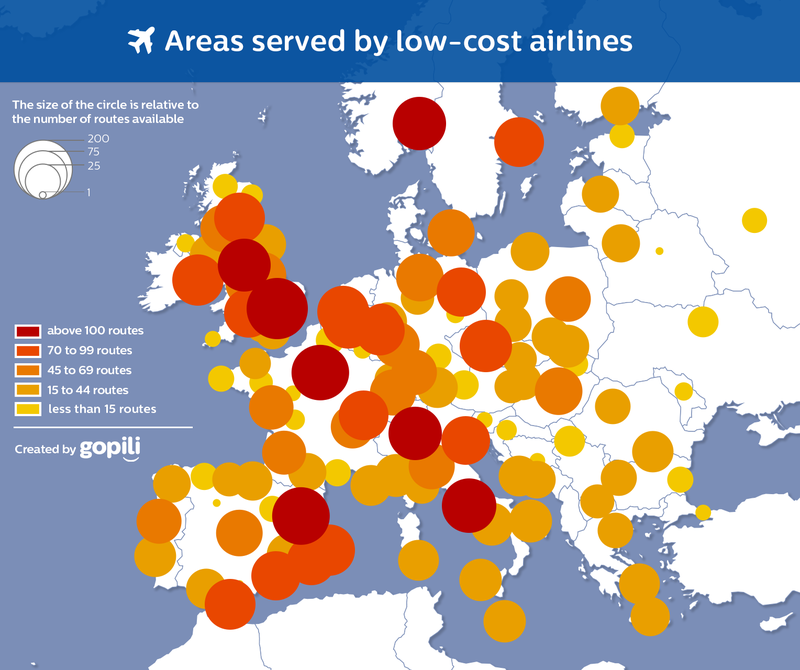 Gopili has analysed the routes served by the 12 major low-cost European airlines to create a map revealing the most and least connected areas as well as rankings of the european countries and cities with the highest number of routes operated by low-cost airlines. The study reveals that UK is the European country the most-served by low-cost airlines with 935 routes available this summer, which means that approximately 18,5% of the 5000 European low cost routes take off or land at a British airport. 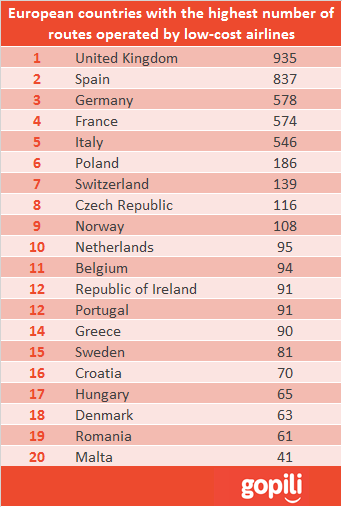 Spain (837 routes), Germany (578), France (574) and Italy (546) complete the Top 5 of the most-served European countries by low cost airlines. The map reveals that low-cost airlines have more presence in the European Megalopolis, a discontinuous corridor from Manchester to Milan, including London, Brussels and Frankfurt. It also appears that there is a significant gap between the different regions of the Mediterranean coast. While countries like Spain and to a smaller extent Italy are well served, France only has 43 routes from Nice, 17 from Marseille and 11 from Montpellier. Other concrete examples are Albania, Greece and Turkey, badly served on their coast comparing to other European countries. Aside from Poland and Czech Republic, citizens of Eastern Europe have much less opportunities to fly with low-cost airlines. London is the best-served European city with 217 low-cost flight destinations, partly because of the high number of airports connecting the capital to Europe. The second place is shared by Paris and Barcelona with 160 routes, followed by Rome (122) and Milan (112). 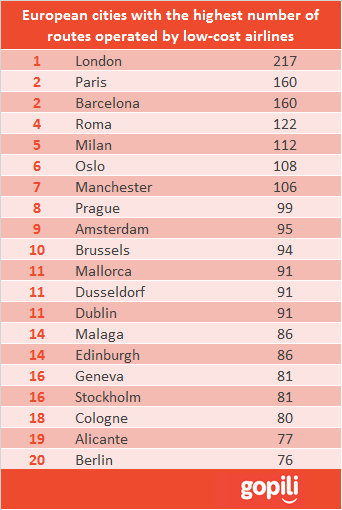 Manchester (106) and Edinburgh (86) are among the top 15 European cities best-served by low cost airlines, ahead of capital cities like Berlin, Madrid, Stockholm and Geneva. Different factors including the smaller total area of the country as well as the important number of UK-based low-cost airlines enable most UK citizens to be less than 2 hours’ drive away from an airport served by low-cost airlines. *Data have been collected taking only into account direct flights available from 125 European cities and operated by Ryanair, Transavia, EasyJet, Vueling, Volotea, Wizzair, Smartwings, Jet2, Flybe, Germanwings, Norwegian and Monarch. The total number of destinations per city has been calculated counting only one destination even if the same route was served by several low-cost airlines.